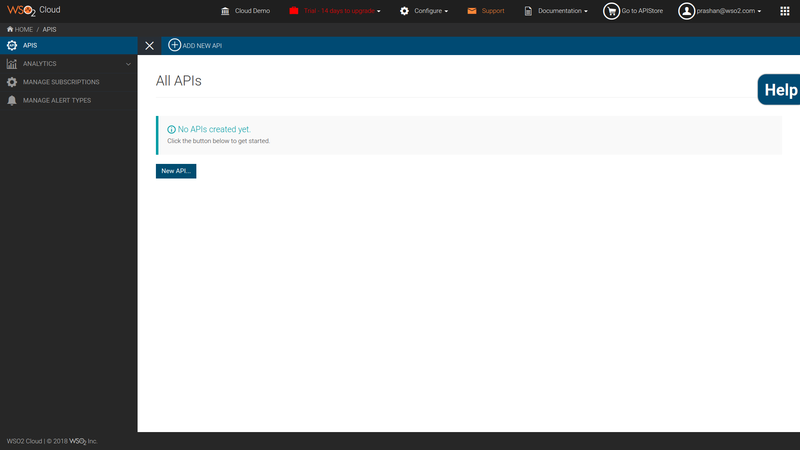 The WSO2 API Cloud add-on is currently in beta. Design your APIs and provide a unified development experience for application developers. Set up a themeable, customizable Developer Portal (API Store) at your own URL. Manage the developer community by allowing self-signup and blocking subscriptions. Use API monetization capabilities and support free, commercial, and freemium models. Implement access control on APIs using industry standards such as OAuth and SAML. Automatically scale to meet the needs of any API demand. Route API traffic through a highly scalable API Gateway, orchestrate, and transform calls and responses. Monitor API usage and performance using analytics, reports, alerts, and automated fraud detection. After you install WSO2 API Cloud, your application should be configured to fully integrate with the add-on. This app implements a simple echo service that takes a text parameter and returns the word Hello along with the provided parameter. or by visiting the Heroku Dashboard and selecting the application in question. Select WSO2 API Cloud from the Add-ons menu. If you do not have an account in WSO2 Cloud, the UI directs you to create one. If you already have an account in WSO2 Cloud, select the organization that you want to associate with your Heroku account. 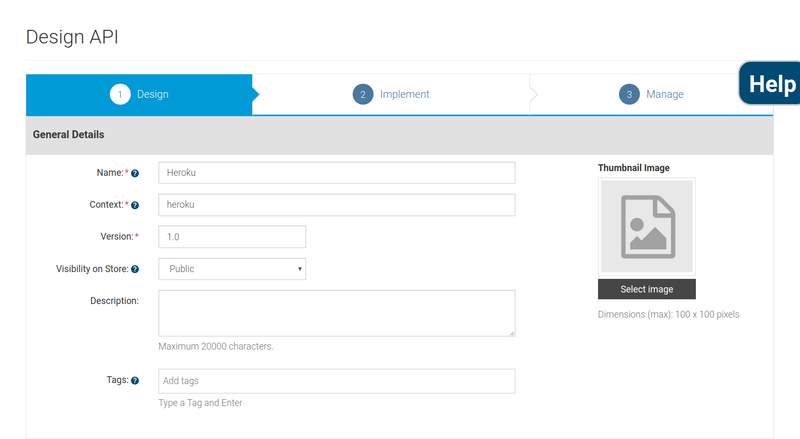 Select Design a New REST API and click Start Creating. In the API Definition section, enter hello as the URL Pattern and select the GET checkbox. Click Add. 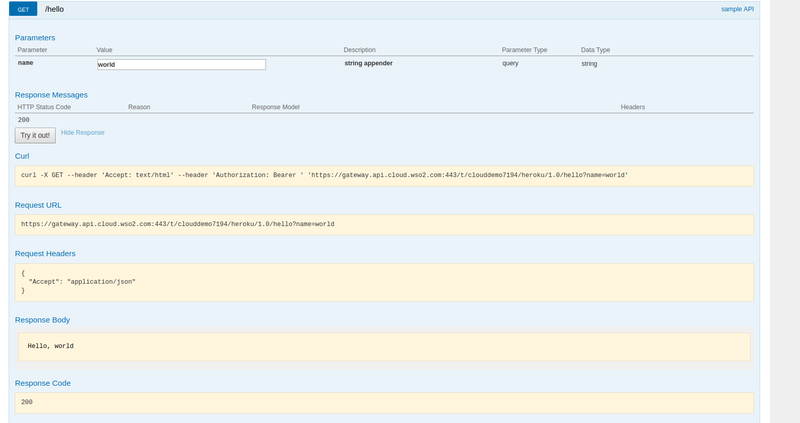 In the API Store, click the API Console tab. Expand your API’s /hello method, provide a value to the name parameter (e.g., World), and click Try it out. The API calls your backend service in Heroku and shows the execution results. You have successfully created a managed API based on your Heroku service. For more information on the features available within the WSO2 Cloud, please see the docs at WSO2 API Cloud Documentation. 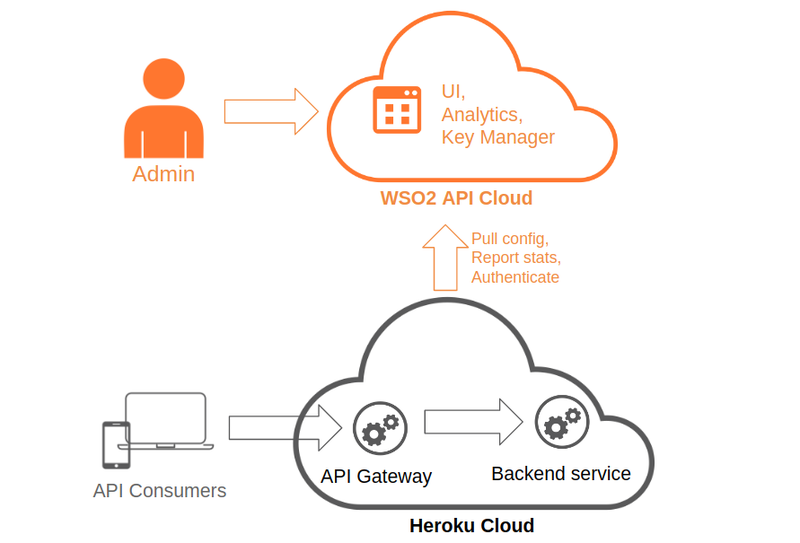 WSO2 API Gateway can be deployed as your own Heroku dyno. This reduces the average response time to serve an API call, which performs all the functions, without the need to connect to other API management components. Performance: You can put your API gateway close to your backend services and API subscribers, avoiding the costly extra hops to the cloud and back. Security and Compliance: API calls and payload data does not leave your network. This keeps your security and compliance officers happy. Connectivity: Your API gateway is running on Heroku, so you do not have to set up a VPN or another alternative to expose your Heroku backend to the internet. If you remove the WSO2 API Cloud add-on, your account at WSO2 API Cloud will be disabled one month after the next billing date. All WSO2 API Cloud add-on related issues should be submitted via one of the Heroku Support channels. Any API management related issues in the WSO2 API Cloud should be submitted to cloud@wso2.com or via the contact support UI in WSO2 API Cloud.